All covers and logos ©Marvel Entertainment, Inc. 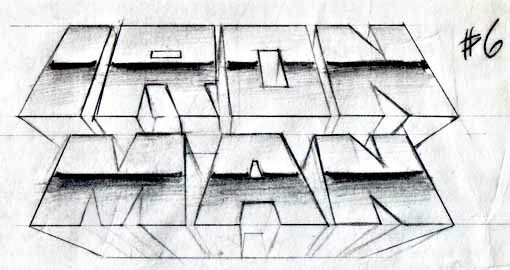 The telescoped Iron Man logo seen in part 1 of this study remained on the cover of his own title from 1968 to 1984 when, for a short time, the previous block letter logo with rivets returned. Finally, in 1985 a new logo appeared. 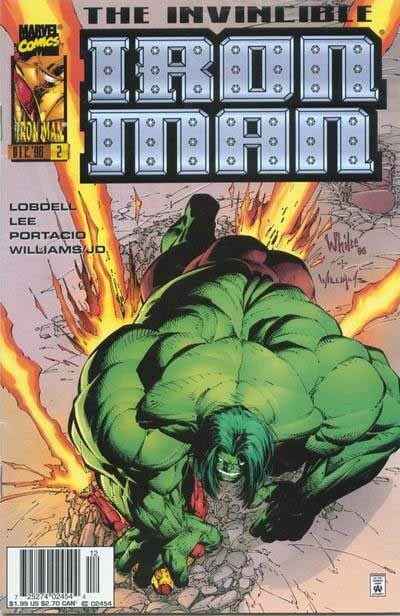 With issue 200 this logo designed by Marvel letterer Jim Novak took the cover spot. It’s well-crafted with some interesting features. Most prominent is the I shaped like a steel I-beam. This certainly ties in with the metal theme, and creates an interesting contrast with the rest of the letters, as it appears to have very large serifs, and the others are without serifs. 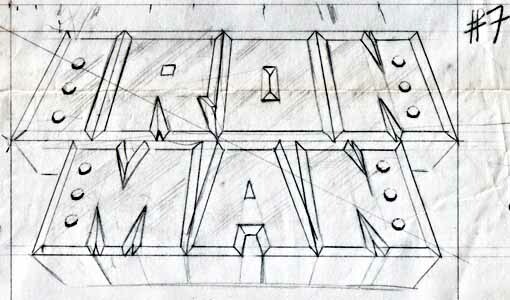 The words IRON and MAN are on two lines, allowing the letters to be much wider. The curves of the R and O are squared at the top and bottom, something that I think adds strength, and telescoping that points up and back to the right adds even more. The entire logo has a lot of weight, as I think is appropriate for the character. One thing a bit odd about the telescoping is that it looks to me like it doesn’t recede toward a vanishing point, as would be the case if it were in perspective. All of the receding diagonal lines seem to be at the exact same angle, and the back side of the telescoping is the same size as the front. Rather than perspective, this is similar to the drafting technique called Isometric Projection, and is the only example of it I can think of in a comics logo. Overall, I think it was a good improvement over what had come before. 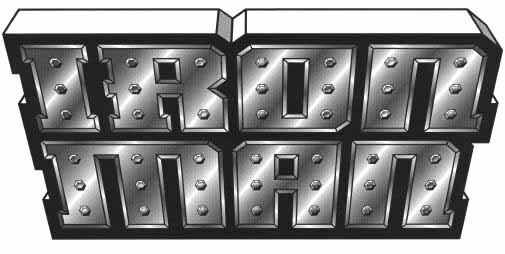 Marvel may not have liked it as much as I did, though, because in 1985 they asked for a new logo from then staff letterer Ken Lopez. Ken was able to find two of the seven sketches he did at the time, and has allowed me to share them here. In the days before computer graphics and programs like Adobe Illustrator, adhesive plastic sheets of gradient dots like Zip-a-tone were the only way to get that effect, other than to do it at the coloring stage. If Ken had gone that route, it would have looked cool, but limited the size the logo could be used at. Too small, and the dots would not reproduce. Too large, and the dots would be distractingly large themselves. And the final inked version is below. In addition to the bolt change, note the addition of bevels on the inside openings of the R and A, and other small changes that improve the design. 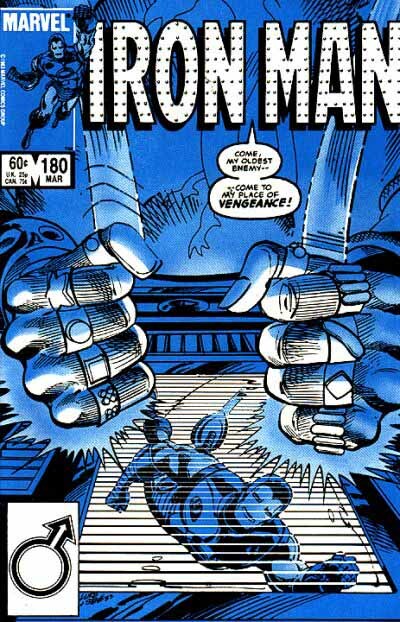 At last IRON MAN had a logo that seemed right for the character, and was both attractively designed and modern! I think Ken has taken some of the best elements of what had gone before and added fine new ideas. Telescoping with two-point perspective is back, this time with the front of the letters receding backwards at the top. The letter forms are very thick and square, and tight against each other, which might have made them a little hard to read, but Ken has wisely added a beveled edge around each letter so that what we read visually is the center part between the bevels. That provides another subtle three-dimensional area for color to help with readability. The heavier outer line around the bevels helps hold each letter together. Finally he’s added two lines of large hexagonal bolts: much more attractive than the mass of tiny rivets on the earlier version, and contributing to the feeling of strength and metal construction. This is a terrific logo, by far the best one for the character since his creation, and it would stay on the covers until 1996, a good long run. In 1996 Marvel decided to license out some of their characters to two of the creator studios that had formed Image Comics. Iron Man went to WildStorm Productions headed by artist Jim Lee. I was already working on a title for them, and was asked to create a new logo for their relaunch of the character, which I was happy to do. WildStorm didn’t want a completely new idea, though, just a new take on the fine Ken Lopez logo that had been on the Marvel book for some time. I produced three versions on the computer for this logo. The biggest change from Ken’s is that the letters have much wider vertical strokes, and narrower horizontal ones. Serifs have been added added to some letters, but not all, in a way I thought helped balance them visually. I didn’t want the I to be too narrow, for instance. I liked Ken’s beveled edges, and kept that idea, but made the bevels narrower. I also separated the letters a little and used a heavier outline around the outside of each. Some corners of letters were given diagonal relief, others were square, adding variety. My drop shadow was mostly solid black except for the bottom edge. This version was head on, no perspective, and features a much heavier outline and diagonal hex bolts with small facets of their own. Looking at it now, I think the bolts would have looked better without the facets. The very heavy outline really helped the weight and readability of it, though. Finally I did another perspective version, this one with the letters receding at the bottom, and added metallic gradients in Adobe Illustrator for a more metallic look. This version retained the heavy outline with the telescoping coming off that. WildStorm like the gradients, and asked for them on the straight-on version 2, which is what they went with for the book. Though as you can see on this cover, they made the gradients much more subtle, using color, and having them grade vertically rather than at the angle I used earlier. I think the result looks pretty good, but the WildStorm license only lasted about a year, and the character was then returned to Marvel. This made way for another relaunch, and we’ll begin with that next time. 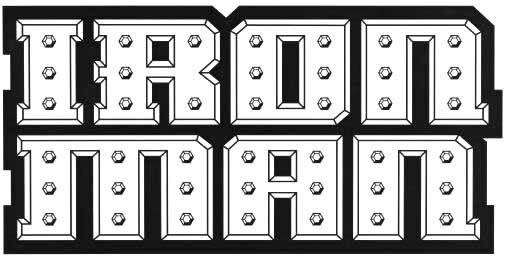 This entry was posted in Logo Studies on June 18, 2008 by Todd. Starting with Iron Man (vol. 1) #292, the rivets were removed from the logo. It’s not that big of a change, but I thought you might want it noted. 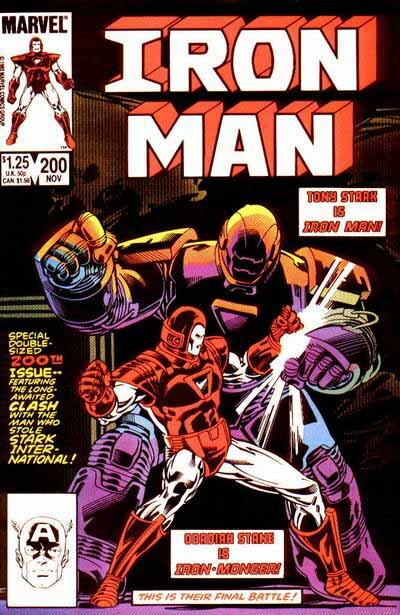 It’s really interesting to hear you so keen on the Iron Man 200 redesign – that’s among the most unattractive to me. Yes, it has weight, but not enough style. For me, the classic is the one that debuted with 11 – a pleasing perspective, and bolts. Still, this is a riveting study . . . I love Ken’s #6 version that was scrapped! 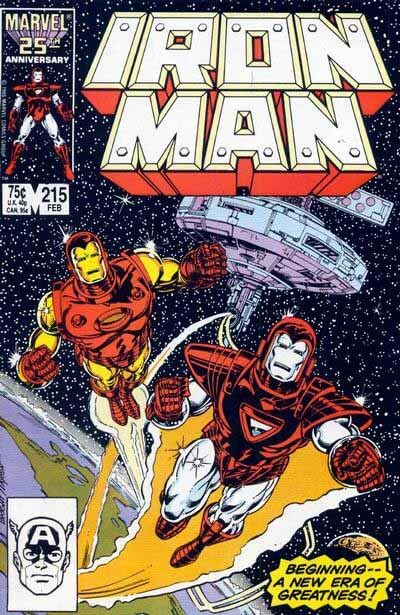 I mean, I really dig the version they went with, especially when they dropped the divots starting with Iron Man #292. But I think that #6 version would have been even better!